In the agony of a nation at war with itself, the Confederate invasion of New Mexico Territory was a minor drama. 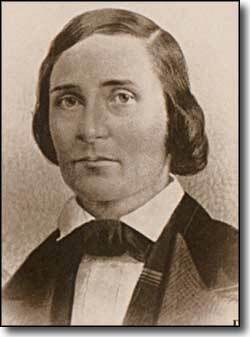 The Rebels dreamed of access to the Santa Fe Trail and the gold mines of California and Colorado. They dreamed of changing the course of the war and fulfilling their manifest destiny. The Union Army knew it had to deny the realization of those dreams. So then, in the westernmost campaign of the Civil War, 4,000 Union and 3,000 Confederate soldiers engaged in battle, with the Confederacy winning tactical victories with every major battle but still returning to Texas empty-handed, defeated by the harsh countryside and the determined people. More than 280 men died here with their dreams. They were assembled at Fort Union and at Albuquerque under the direction of officers like Christopher "Kit" Carson, Manuel Chavez, Ceran St. Vrain, Rafael Chacon, Miguel Pino, and J. Francisco Chavez. Throughout the late summer and fall of 1861, the New Mexico Volunteers were organized, outfitted and received their initial training. As soldiers, these native New Mexicans endured a lot of frustration. They didn't speak English (while the U.S. Army did), they ran into lots of ethnic jealousies and discrimination, they were poorly trained and were outfitted with inferior and obsolete equipment. As late as 1865 they were still armed with the .69 caliber model 1842 musket, which had long since been replaced in the English-speaking regiments with Springfield repeating rifles. However, as Kit Carson said, "the best troops that could be used in war... would be Mexicans..."
Fort Fillmore had been abandoned by the Union the previous July and was quickly occupied by Confederate troops moving in from West Texas. On December 2, 1861 the Union 2nd Colorado Volunteers came through Fort Garland, Colorado and headed south. In February, 1862, all 5 regiments of New Mexico Volunteers were sent south to Fort Craig (30 miles south of Socorro) to wait for the Confederate advance up the Rio Grande. On February 7, 1862 Confederate forces left Fort Fillmore and headed north towards Fort Craig but marched well around the fort. On the 21st of February, 1862, Union and Confederate forces first met at Valverde. The Battle of Valverde was a Confederate victory and forced a Union tactical retreat. On February 23, the Confederate forces marched around the Union Army and headed for Albuquerque, arriving there on March 2. Before abandoning Albuquerque, the Union forces burned their supply depot to the ground. On March 11, 1862, the Union 1st Colorado Regiment reached Fort Union in northern New Mexico after a forced march from Denver. On March 13, the Confederates entered Santa Fe. 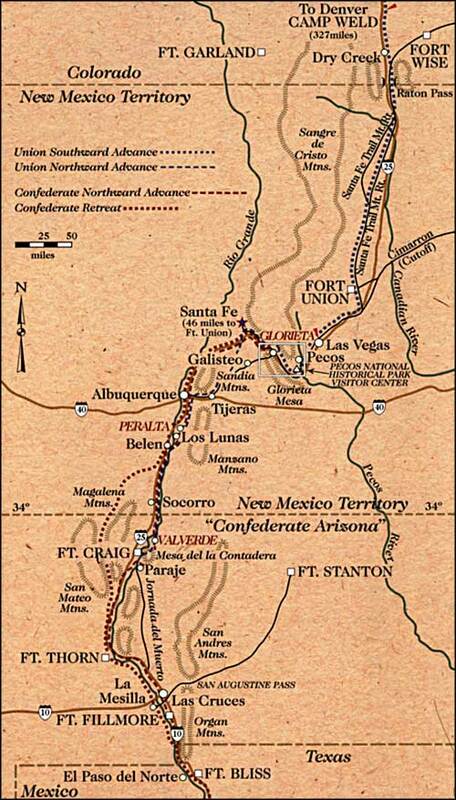 On March 20, the rest of the Confederate column left Albuquerque and headed up the Santa Fe Trail towards Fort Union. On March 22, the Union Army left Fort Union to march to Santa Fe. 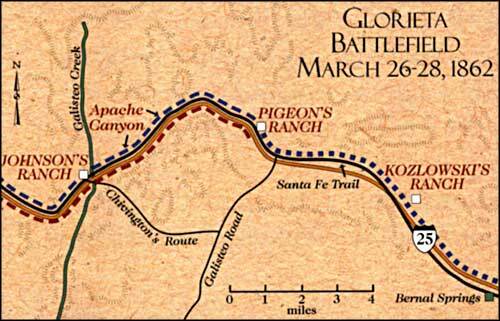 On March 26, 1862, the opposing armies met at the Battle of Apache Canyon. This was the only Union victory of the entire campaign. 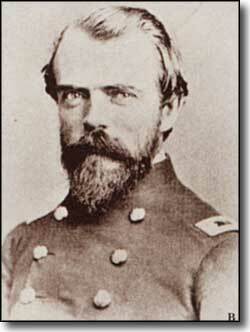 On the following day more Union reinforcements arrived in the area at Kozlowski's Ranch. After guiding some 400 soldiers (including Colorado Volunteers and regular Union troops) over the top of Rowe Mesa to Canoncito at Apache Canyon and pointing down to Johnson's Ranch 500 feet below, US Lieutenant Colonel Manuel Chaves said, "You're right on top of them, Major." Major John Chivington's men then rapelled down the side of the mesa and overturned and burned the entire 80-wagon Confederate supply train with all their food, clothing, ammunition, and forage. Technically, the Confederates won the Battle of Pigeon's Ranch but had no choice but to retreat southward when it was all over. "Come on and help me take that position or stay back and watch men who will." 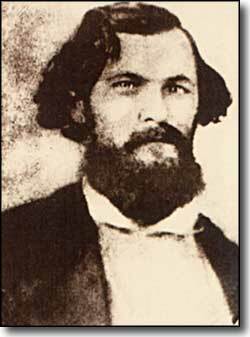 Confederate Major John Shropshire, just before he was shot between the eyes at the Battle of Pigeon's Ranch. An estimated 100 men died at the 3 battles of Glorieta Pass, March 26-28, 1862. "My dear sir, we beat the enemy where we encountered them. The famished country beat us." 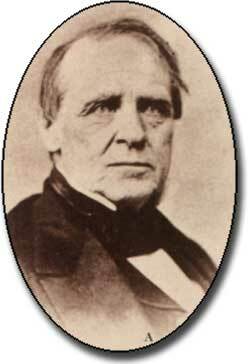 General Sibley, in a personal letter to the father of a fallen Federal soldier. In both major battles of the campaign, Valverde and Pigeon's Ranch, the Confederates were victorious. In the skirmishes at Albuquerque and Peralta, the Rebels repelled attacks against their defensive positions. The New Mexico Volunteers served with courage and distinction, leaving a record of bravery defending their homelands in a time of national emergency. 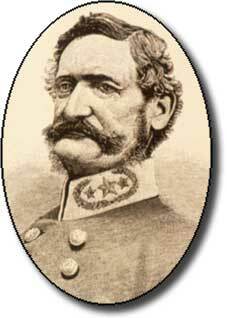 Their service extended from the late summer of 1861 to the discharge of Kit Carson's battalion in late 1867. Canoncito at Apache Canyon, Pigeon's Ranch and Kozlowski's Ranch are now part of the Pecos National Historical Park. Canoncito and Pigeon's Ranch are mostly privately owned and offer no access to the public. Kozlowski's Ranch was added to the National Historic Park when Congress authorized the purchase of the Forked Lightning Ranch (5,500 acres) in 1990 but the area still isn't open to the public yet. I think the black-and-white drawings/photos may be in the public domain (but don't quote me).